A grain free, corn free, bean free, low carb, pot pie that tastes like nachos. 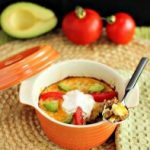 Healthy, Mexican, comfort food! 1 1/4 lb ground beef browned and slightly drained of some, but not all grease (adds flavor to keep some in). 1/3 cup grated cheese of choice (cheddar jack, pepper jack etc.) * optional, omit if paleo. 1/8 tsp smoked paprika * optional. 1 tbsp optional jalapeno peppers chopped and seeds removed or from a can * for spicy lovers only, optional. 1 small tomato chopped * optional. ½ an avocado sliced * optional. 2 ½ tbsp sour cream * optional omit if paleo. 3 tbsp . hot sauce or salsa *optional. Preheat oven to 400 F, and grease 5 ramekins or an 8 inch casserole dish. Brown ground beef in large fry pan, and slightly drain off some grease, not all (this keeps the meat moist and flavorful). In separate mixing bowl combine all the dry, beef seasoning mix ingredients except for the water. Once dry seasonings are combined add water and stir. Pour seasoning mix with water over ground beef in pan and stir. Heat pan to medium high and bring meat mixture to a boil. Turn heat immediately to low and cover. Simmer for 5 minutes. Grind up raw cauliflower in processor until it looks like rice, or could use ricer or grater. In a separate, large mixing bowl combine: cauliflower, and all the not” corn bread pie crust ingredients. Mix together thoroughly. Set aside. Divide the ground beef mixture into five servings, and place a portion of ground beef at the bottom of each ramekin. Or, could spread all meat mixture at bottom of a casserole dish. *Shown in photo above. Divide pie crust mixture in 5 servings and place a portion on top of beef mixture in ramekin. Or, place all crust mixture on beef mixture in casserole dish. Spread crust mixture, with the back of a spoon, around until beef is evenly covered with pie crust. * Shown in photo above. Bake in oven for 23 to 25 minutes, or until pie crust edges are slightly browning, and center is slightly firm. Remove from oven and cool a little. Add desired toppings and serve. Careful, as ramekin may still be hot. Nutritional data includes all toppings and cheese. Nutritional data is an estimate based on the products I used.